When you’re looking for tree removal, tree pruning or other tree services in the Beaverton area, you’ve got a lot of choices. We may be a little biased, but you really don’t need to look much further than the professionals at Urban Forest Pros. Our trained and certified arborists have been serving Beaverton, Oregon, for more than fifteen years. Whether it’s removing a tree that has become a hazard, pruning back a tree to enhance the health of the tree or your view, or perhaps cabling a tree or getting a certified arborist report for your unique Beaverton situation, Urban Forest Pros have got you covered. And unfortunately, many more. Despite the desire to cut costs and do it yourself, calling in a professional arborist to examine your unique situation and advise on the best path forward will save you time, money, and possibly your life. 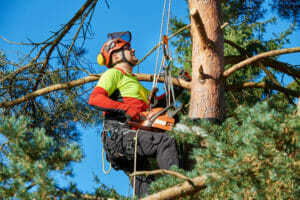 Each year people get killed attempting to perform tree removal work that is much better left to a professional like the ones at Urban Forest Pros. Luckily we offer free estimates. Simply calling us at 503-226-7143 gets the ball rolling. And if it’s an emergency, the number is the same, simply dial “9” and you’ll be connected to the UFP on-call arborist. It doesn’t matter if your Beaverton tree is an ornamental tree, fruit tree, cedar, oak, fir, maple, evergreen or deciduous – eventually you’re going to need to prune it. Perhaps for aesthetic reasons, perhaps to encourage growth or to even increase property value. Whatever the reason, calling Urban Forest Pros is a good move, especially with our free estimates. After scheduling your appointment, our team will come out and discuss with you the situation, look at the tree and find out what it is you’re looking to achieve. While every tree is different, as well as every situation, there are a variety of techniques and services we are able to perform, from a full pruning to heavy thinning to a formal pruning for the best look to match your landscaping preferences. Even if your tree has been damaged before by inexperienced tree service workers, there’s a good chance we can help bring back to its full glory. As you can see, experience has its benefits. Contact us today to set up an appointment in Beaverton to look at your situation and see what the right pruning can do for your tree. It’s simply how things are – if you want to remove a tree, you’ll need to get the correct permits. While the first reaction for a landowner or homeowner may be to push back, there are good reasons for requiring a Beaverton tree removal or pruning permit. Without the current laws it would be easy for people to simply cut down any tree they want. While that may sound nice from a person who has to pay for a permit to remove a nuisance tree in their backyard, trees form an important part of Beaverton’s image and environment. Without the laws in place, developers could just remove trees at will, leaving the landscape much barer than it is. Urban Forest Pros will help walk you through the process of getting the appropriate permits, but you need to request it from us. If you do not, we operate under the presumption that you got the required permits. Be sure you have – sometimes the fines in the Portland metro area can be up to $20,000. No joke. 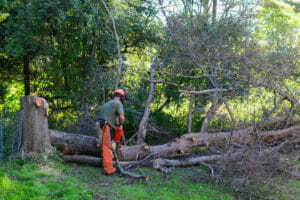 For more info, call us at 503-226-7143 or check out the Beaverton city’s web page on tree services. If you look at enough trees in a metro area known for its trees, you’ll see it sooner or later – a tree leaning more than it should be or a limb extended dangerously over a sidewalk or residential structure. In the urban environment, trees can grow into a hazardous situation. If they are not taken care of, and the worst does happen, the owner of the property where the tree stands could be held liable for the resultant damages. And, worst of the worst, they could be held criminally liable as well. We’re happy to help out. 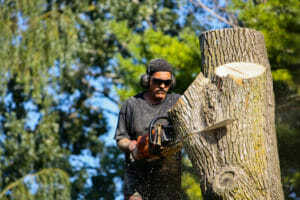 One of our certified arborists can come out to give you a free estimate. If you’re right and the hazard needs to be removed, then you’ve called the right people and we can continue with the pruning or cabling, depending on the situation. If our arborist decides the situation is safe and does not need to be addressed, you can rest easy. Regardless, it starts with a phone call and Urban Forest Professionals are the right people to call for your Beaverton tree questions. Just like people, sometimes trees need a little extra support. Cabling helps Beaverton trees from failing unexpectedly. The procedure can be used to limit storm damage or prevent limb failure over residential structures when limb removal is either not desired or would create further problems. As you can probably see, there are more than a few tricks up the sleeves of our certified arborists. Tree cabling is just one of them. And with our free estimates, you can be assured that you’re being provided with the best options with no money out of your pocket. Simply call us at 503-226-7143 to get started on finding out what your unique Beaverton, OR, tree situation requires. This is just a handful of the wide variety of tree services we offer the fine people of Beaverton. From view enhancements to organic pest control, certified arborist reports, height reduction pruning, deep root fertilization, tree planting, stump grinding and more, we are truly the company to call when you need tree services in Beaverton. Do not hesitate to call us at 503-226-7143 to find out what we can do for you. How long does an oak live? How tall can Cottonwood get? How often should I prune my rhododendrons? How does pruning affect my cherry tree? What are the best trees for the pacific northwest?